CASS•E, the Cranfield Astrobiological Stratospheric Sampling Experiment, aims to detect if there are microorganisms in the stratosphere. CASS-E is being designed and built by a team of post-graduate space engineering and life sciences students from Cranfield University in the UK. In October 2010 CASS•E will fly on the BEXUS stratospheric balloon launched from ESRANGE inside the Swedish arctic circle to a height of 25 – 35 km (three times higher than a commercial airliner flies). What is this experiment about? As part of this project we have launched an outreach programme, with the aim of promoting science and engineering careers to young people. We participated in National Science and Engineering week 2010 with a local school and are working with Girl Guides and Brownies , running science and engineering based activities to promote women in science and engineering. For more details please see our blog and media page. Why are we trying to detect microbes? Microbes are one of the simplest forms of life, they are made up of a single cell, (the human body contains about 100 trillion cells) and are too small to see with the naked eye. Microbes can be found everywhere, there are about 10 trillion in your mouth right now! Some microbes can survive and grow in very hostile environments where other living things would not survive, for example under ice, in very salty water, in hot springs, 10 km under the ocean and even in oil wells and in highly radioactive areas of nuclear power plants. Detecting microbes in the stratosphere will help us to understand how microorganisms are transported from one area of the earth to another. In addition to this it can help us to understand whether the theory of Panspermia is possible. This is the idea that life on Earth may have originated somewhere else in the universe and been transported here through space, perhaps by a comet. The European Space Agency is considering the possibility of using a balloon platform as part of the EVE program (European Venus Explorer). There have been a number of previous attempts to detect life in the stratosphere using balloon based platforms, high altitude aircraft and meteorological rockets. However many of these experiments failed to adequately the address the issue of contamination; since levels of microorganisms in the stratosphere are expected to be very low compared to ground based contamination (remember the 10 trillion microbes in your mouth) how can we be confident that any microbes we detect are truly from the stratosphere, rather than from ground based contamination? What is Planetary Protection and Contamination Control? In the space industry planetary protection and contamination control is applied in an attempt to prevent the harmful contamination of other planetary bodies and to prevent adverse changes in the Earth’s environment resulting from the introduction of extraterrestrial material carried by space craft returning to Earth. It is especially important for life detection missions since if life was detected on Mars for example, we need to be confident that we are not detecting something that we took to Mars on the spacecraft. Planetary protection and contamination control protocols involve the cleaning and sterilisation of space hardware, determination of the level of cleanliness and the implementation of measures to maintain cleanliness, for example the use of clean rooms for assembly. How are we going to detect microbes? 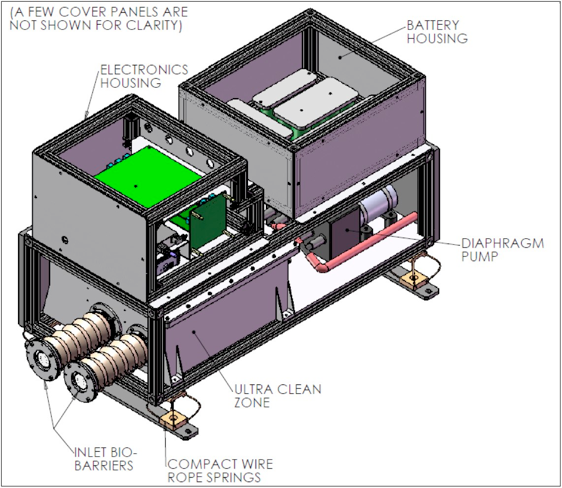 CASS•E essentially consists of a filter to collect microbes and a pump to pull stratospheric air through the filter. In order to prevent contamination the filter will be sealed inside a bio-barrier and then sterilised by dry heat microbial reduction (heating in an oven at elevated temperature for several days). In order to test if the bio-barrier works we are going to deliberately contaminate the exterior of the balloon gondola with fluorescent beads, which are the same size as the micro-organisms we want to collect, if we find fluorescent beads on the filter we will know that contamination may have occurred. The bio-barrier will remain sealed until the BEXUS balloon reaches the stratosphere, where it will open to allow the pump to pull air through the filter. Before the balloon descends, the filters will be sealed from the outside using a valve to prevent contamination during decent and landing. 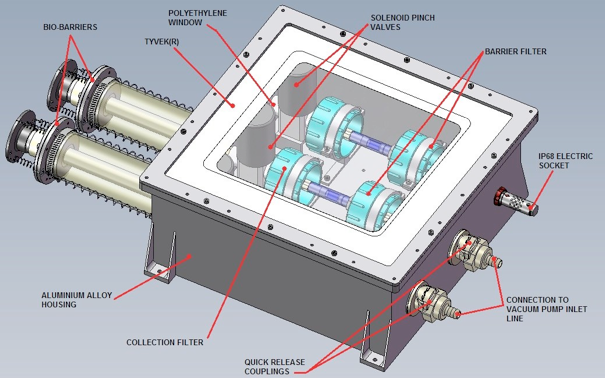 In order to achieve this we have to design and build a self contained and fully automated system complete with electronics and software to control the experiment and to relay data to the ground. Conditions in the stratosphere are challenging – it is very cold and the pressure is very low (near vacuum conditions) so all of the components we use have to be rated and/or tested for these conditions, or we have to maintain their temperature using heaters. Where are we launching from ? The launch will take place from Esrange in Kiruna Sweden, shown on the map below.